5 Simple steps to a DIY Valentines Day Photo Session with your child. Today I want to talk a little about how to get a great Valentine's Day photo of your child. Easily. I know there are lot of "mom-togs" and others out there, searching relentlessly through Pinterest and trying to find that ONE great idea. And believe me there are plenty of great ideas that float around, but how do you pull off that great idea once you have it? No one said you have to be a professional photographer, artist or master craftsman to be able to design and set up a scene for a photo shoot. Here are some simple, attainable solutions to making a great Valentine's Day photo of your child. Used: 2 boxes of leftover flooring. 1 leftover baseboard painted white. Some non-permanent tattoos and a bunch of construction paper hearts. Studio lights used to create this photo. You don't have to go to the ends of the earth trying to find the greatest backdrops, props or "scene" to make a simple portrait. A great photograph can come from anyone, anywhere, anytime. First let's start at home. You have kids right? I'm assuming that's why you're here reading this.... ha ha. Look around your house and try to find things that help make your idea come to life. Grab a random blanket that you found lying on the couch. Perfect, there's a backdrop. Find some construction paper you have laying around and make some paper hearts and flowers. Find your stash of stickers, or extra tattoos. Grab some straws. Get an old cardboard box and make a kissing booth. How about making some silly mustaches out of paper? Excuse me, but I mustache you a question.... are you getting the idea that this is super simple!?! Yay! Use a couple of chairs to hang your "backdrop" on. Use a desk or dresser drawer, fill it up with paper confetti and let the fun begin! You know that old laundry basket you have laying around? Wait... did you just say laundry? Yes I did, and no it's definitely not laundry time. I know you're already a busy mama! Take that old laundry basket and use it as a prop! Put that blanket over the laundry basket, fill it with a few blankets and boom, you have a nice warm spot to put your toddler in. They already find baskets so amusing so this shouldn't be hard to pull off at all. Even simpler you ask? Use your house as a "backdrop". With the correct camera settings you can make anything look dreamy and new to you! Lifestyle photography for family sessions is becoming more and more widely used. It's a super fun, relaxing way to shoot a session. Lifestyle photography is a kind of photography which mainly aims to capture portrait/people situations, real-life events or milestones in an artistic manner and the art of the everyday. The primary goal is to tell stories about people's lives or to inspire people in different times. I simply moved my kitchen table to grab this shot. Perfect background. I didn't need to purchase a thing! Sometimes the best photo's can be made anywhere, anytime by anyone! Natural lighting coming in from stage left used for this photo. 2: Props don't have to be expensive. Most of the props you use could be made at home with the things you have lying around the house. Think about how much "stuff" we have for our kids to craft with. There has got to be something among those items, right? If not, two of my favorite places to shop for inexpensive items are Michaels Craft Store and any Dollar store. At Michaels you can buy 1 item and get 40% - 50% off. Need a basket? No problem it's, half off. What about these photo booth props pictured below: 10 bucks half off! Or some funky glasses and mustaches! One trip to the dollar store, done! Want a super cute toddler photo? Grab up a bunch of dollar store necklaces in different shades of red and pink. Voila! How about balloons? Balloons are super cheap, super fun and OMG, they're balloons! Every little kiddo loves playing with balloons. How about grabbing some sharpies and writing your own personalized messages on your balloons? Now that would be super cute! Oh and last but not least, red lipstick. Because you have to show off your little cutie covered in kisses to all of your friends! Props, props and more props! The kids had a ton of fun with them! I hear a lot of moms say to me, "I would rather have someone else photograph my child because they don't listen to me." Or, "my kids don't like taking photos." Totally get it! The way I get my son's participation is playing with him. It's a game, you see? If he doesn't want to smile, I ask him to make his best frown face, or I ask him to do a silly face. I am a go with the flow kind of gal, that's just the way I roll. Eventually we get back to joking around, smiling and getting a great shot. The interaction is what he needs and I am more than willing to act like a big goofball to get it. No one wants to do things they don't want to do... duh. If it truly isn't working out that day try again another time, but don't resort to bribery. It never works. Kids only understand bribery after a certain age and even then, it's iffy at best. Give them something to interact with during the photo shoot and play with them. Photography should be fun, not stressful. What about photographing at your local mall? Most malls have tons of natural light! 4: Natural Lighting is free! Unless your own an entire studio lighting setup, I suggest you use a big natural light source. Like your living room window. Place the child in front of the window (their face pointing toward the window) to light them. Have your husband, a friend, your eldest child, the neighbor, grandma, Uncle John's cousin.... WHOEVER hold a white blanket off to the side to reflect some light back into your child's face. Better yet remember that cardboard trifold you used to present your science experiment in 7th grade? Yup! That kind of cardboard material works really well for bouncing light back onto your subject. In white of course. You can use black as well but that's a entirely separate blog post. You can pick up cardboard like this at any local craft store. What about taking a little trip to your local mall? For instance the mall down the street from me has tons of skylights. Beautiful natural light, no flash neccesary. The best time of day to do this is right after the sun comes up and before it sets. Depending on what season you're in the times vary for sunlight. After the daylight is gone, it will be harder for you to light your subject, without the use of an external light source. External light sources if not used correctly can create harsh color casts on your subject's skin. 5: Presenting your hard work! Last but not least, let's talk about presentation of the final product. Again get crafty. I know you can do it! Search through thrift stores to find things like frames, jars, chalkboards, even glass plates. Find an old piece of wood and do a photo transfer. Yes! This is the coolest project to do! I will post one of my own transfers below. The grandparents would love that and it's super fun and easy to do. Pick up an old frame and spray paint it with chalkboard paint... OHHHH! Take a jar and do a photo transfer to the glass. Or mount your picture to the bottom of the glass. How about mounting your portrait to a chalkboard and then writing a super cute message on it. What about making an adorable collage to be framed. The possibilities are absolutely endless! So to end off here, I hope this has helped spark some interest and creativity into what you will do for your next V-day photo shoot. Questions? Comment below and I'll get right back to ya! 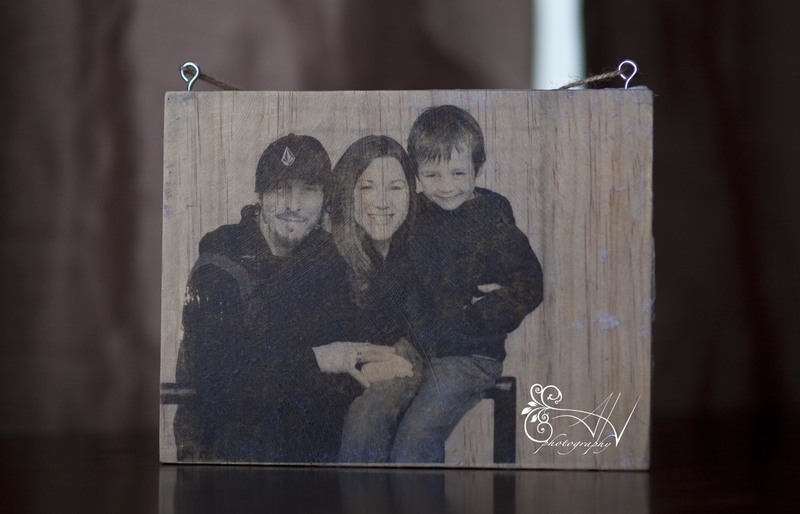 A photo to wood transfer of my family. Click this link to see a video of the entire process.